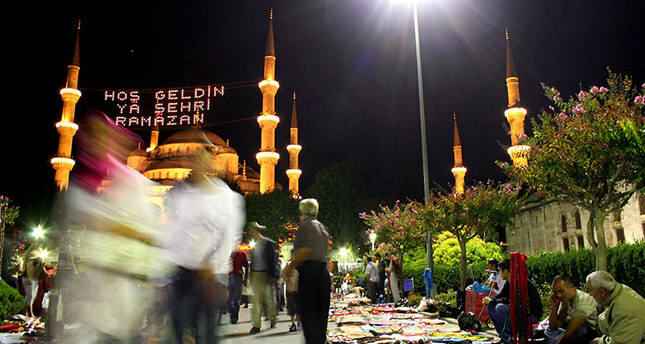 With only a few days left till Ramadan, -considered by Muslims to be one of the holiest months in the Islamic calendar-, millions of people around the world are preparing to observe a month filled with fasting, prayer, and worship to feed their souls as they starve their bodies from dawn until sunset. The Daily Sabah has compiled a list of tips and suggestions to help those fasting to prepare and adjust their bodies amid long summer days and heat in order to avoid slowing down the metabolism. It is recommended that those who are planning to fast start training their bodies from already now to adjust. For instance, skipping snacks and even fasting a few days before Ramadan is recommended to make an easy transition to Ramadan. Try to adjust your sleep cycle in line with Ramadan as you will be waking up early for suhoor. Findings indicate that the human body can survive without food for weeks, but it can only survive for a few days without water. Experts suggest that people should drink at least two liters of water (8-10 glasses) during the month of Ramadan. Coffee and tea lovers should remember that such fluids alone do not fulfil the daily amount of needed to sustain the body. Soups have traditionally been an inseperable part of Ramadan tables in Turkey regardless of the season. Starting your meal with soup will prepare your stomach. Since Ramadan will be observed under summer heat this year, we suggest that you try the "ayran aşı" soup, which is made from yogurt and is served cold, sure to refresh the body after long hours of fasting. Eating slowly will help your stomach to digest foods easily, as digestion starts in the mouth. Remember that the brain takes about 15 to 20 minutes to start signaling feelings of fullness. Make sure that you consume enough protein and calcium-rich foods such as meats, dairy products like milk and yogurt, legumes and eggs. Experts suggest that having desert after one to two hours following iftar (breaking your fast) is okay as long as it is not thick, fried, and heavy such as baklava, künefe, and other Turkish specialties which are made with heavy ingredients such as flour, butter and sugar, which are sure to please the taste buds but may not be the best choice for your stomach after a long day of fasting. Ice cream, pudding, or fruits are some light deserts which can satisfy your sweet tooth. Eating hot, salty and spicy food during Ramadan is not recommended as they can cause dehydration during the day. Having healthy snacks such as nuts, dried fruits and dates will not only boost your energy but will also provide healthy nutrients for your body. A dramatic change in your routine like Ramadan can negatively affect your bowel movement. This could be prevented by enriching your diet with fiber rich foods including whole grains, fruits and vegetables. Do not mistakenly think that it is okay to eat more than what your body is used to, after a long day of fasting. Control your portions to avoid gaining weight and better digestion. Do not skip suhoor, the pre-dawn meal which will prepare your body for a long day of fasting. Many state suhoor is the most critical meal of the day as it prevents slowing down of your metabolism. Having a filling suhoor meal can prepare your body and provide strength. Whole grain breads and cereals are recommended to maintain blood sugar levels throughout the day. Having less energy throughout the day, people tend to be less active during Ramadan. Going for a walk after iftar is recommended to avoid slowing down of your metabolism and burn extra calories. Everyone's body may have different needs and requirements, so it is crucial that you speak with your doctor if your medical condition requires attention. Remember, moderation is key to ensure that your body and digestive system are not exhausted during the holy month of Ramadan.